The United States had a global current account deficit (the broadest measure of all trade in goods, services and income) of $470 billion (2.5 percent of GDP) and a goods trade deficit of $750 billion (4 percent of GDP) in 2016. Meanwhile, a handful of countries have developed large, structural trade surpluses that reached $1.2 trillion, which have effectively transferred millions of manufacturing jobs from the United States and other countries to these surplus countries—have hampered economic recovery in much of the globe—and now threaten to destabilize the global economy again in coming years if not reduced. The last thing we need is to negotiate more trade and investment deals. And we should avoid raising tariffs on Mexico that will just hurt workers in both the United States and Mexico. It would be too costly to withdraw from the North American Free Trade Agreement but it could, and should, be improved. 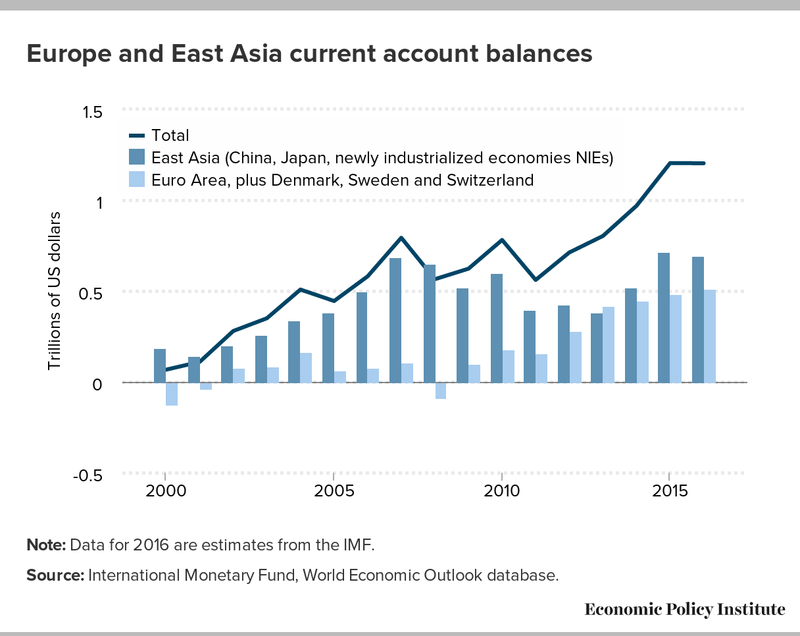 We do need to address the root causes of the $1.2 trillion global trade surplus that has been engineered by countries in Europe and East Asia, led by China, Germany, Japan and Korea. These problems include unfair trade policies, massive excess production capacity in a range of industries and, most importantly, significantly undervalued currencies. Global trade surpluses are also generating massive capital inflows that are fueling real estate and asset bubbles that could lead to another round of global financial crises. This is the hidden underbelly of a growing potential Trump-bubble in financial markets that must be addressed before it gets out of control. Thus, it is doubly important to reduce global trade imbalances in order to rebuild U.S. manufacturing, restore order to the global economy, and eliminate the threat of yet another Great Recession. Trump has claimed that he can force other countries to give us better terms on trade deals because he is a tough negotiator. During the campaign he said, “I intend to immediately renegotiate … the NAFTA [North American Free Trade] agreement.” If he doesn’t get what he wants, he will withdraw from the deal, he says. He clearly has a point that our trade deals have been bad for American workers. And these deals have little to nothing to do with “free trade.” Instead, NAFTA and other recent trade and investment deals such as the U.S.-Korea Free Trade Agreement and the proposed Trans-Pacific Partnership (TPP) were designed to create a separate, global set of rules to protect foreign investors and encourage the outsourcing of production from the United States to other countries. These deals contain 30 or more chapters providing special protections for foreign investors; extending patents and copyrights (enriching the wealthy); privatizing markets for public services such as education, health, and public utilities; and “harmonizing” regulations in ways that limit or prevent governments from protecting the public health or environment. These rules are all enforced by special “investor state dispute settlement (ISDS) panels,” private arbitrators that transfer sovereignty from domestic courts to “independent” international lawyers (who work for multinational corporations [MNCs] one day and decide cases the next—so much for “unbiased” law). These deals do much more than cut tariffs or promote trade. They promote outsourcing and shift the balance of power from workers to investors based in the United States and other countries. Trump is also correct that the system for creating such deals is fundamentally corrupt. Government negotiators (trade lawyers who often have their own deregulatory agendas) are, by law, advised by committees composed of hundreds of representatives of multinational corporations who, in essence, dictate the terms of these agreements. The process is fundamentally flawed. And, many of the negotiators, and leading policy makers, are part of the revolving door conspiracy where they negotiate provisions for their former employers who they often rejoin right after negotiating the sweetheart deals. But we can’t just wave a wand and undo NAFTA because the United States, Mexico and Canada have 20 years of involvement in the deal and cancelling it would create havoc. NAFTA must be improved by raising labor standards. Mexico has some of the weakest labor laws in the world and labor rights are under attack across the United States, so workers throughout the hemisphere would be helped by a joint agreement to raise labor standards to Canadian levels. In addition, both countries could gain from measures to dramatically increase the required North American content of goods deemed to originate in the region, and by eliminating the investor-state dispute settlement system from the agreement. However, Donald Trump and his billionaires’ cabinet are unlikely to make these kinds of changes to the NAFTA. Worse yet, slapping tariffs on Mexican imports to pay for Trump’s proposed border wall will not solve any problems for American workers. Our economy is tightly integrated with that of Mexico and Canada. Any job-creating forced from increased domestic production following the imposition of tariffs on Mexican imports would be strongly muffled by job-displacing effects of higher-priced U.S. goods—including parts used to produce other U.S. goods for export (thereby hurting U.S. exports). Imposing high tariffs suddenly would also harm workers in Mexico, and likely result in a trade war that would only escalate these costs further. The Republican Party and the business interests it represents have been the chief proponents in the passage of these destructive trade deals. Two-thirds of the votes needed to pass NAFTA in 1993 were provided by Republicans. In fact, NAFTA was Ronald Reagan’s idea, and was first introduced and negotiated by President George H. W. Bush. More recently, 85 percent of Democrats in the House and 70 percent in the Senate opposed giving the president Fast Track authority for the TPP and other trade deals, while 87 percent of Senate Republicans gave final approval to the Fast Track bill. It was Republicans in Congress who helped these trade deals go forward. And it was Republican leaders who blocked legislation that would have given the Commerce Department tools to tackle the currency manipulation that is behind the loss of jobs to exporting nations that break the rules. This history makes us suspicious that radical improvements in U.S. trade policy that would benefit working-class Americans will occur under joint Republican control of the Presidency and Congress. The solutions Trump himself has put forward reflect little understanding of what a smart trade regime would look like. Instead of relying on Wilbur Ross to save us from a corrupt system of trade agreements from which he personally benefitted, we should instead call a halt to the negotiation of all new international trade and investment deals. Meanwhile, instead of vague promises about “better” trade deals, we need a trade policy that forthrightly addresses the fundamental causes of growing trade deficits—deficits that are causing our trade-related job losses and depressing the wages of most working Americans. Countries that engage in unfair trade practices tend to develop sustained, structural trade surpluses with the world as a whole. China, which has the largest, most persistent goods-trade surpluses in the world, is the leading example. China both subsidizes and dumps (selling below costs) massive quantities of exports. In addition, it blocks imports, pirates software and technology from foreign producers, invests in massive amounts of excess production capacity in a range of basic industries (investments that lead to dumping), often through state owned enterprises (SOEs), and operates as a refuse lot for carbon and other industrial pollutants. China has also engaged in extensive and sustained currency manipulation over the past two decades, resulting in persistent currency misalignments. Roughly twenty countries, most in Asia, have engaged in persistent, sustained currency manipulation, by buying up massive quantities of Treasury bills and other dollar denominated assets (currency intervention), driving up the value of the dollar and driving down the yuan and other currencies. Currency manipulation acts like a subsidy to the exports of all those countries, and a tax on U.S. exports to the world. Although China has not intervened against the dollar in the past two years, the yuan remains massively undervalued, and misaligned, vis-à-vis the U.S. dollar, as do the currencies of a number of other unfair traders. Before turning to remedies for unfair trade and currency misalignment it is important to consider how the United States should go about setting trade priorities. The Trump administration has complained frequently about NAFTA and the U.S. trade deficit with Mexico, which reached $63.2 billion in 2016. While NAFTA is seriously flawed, for reasons noted above, Mexico does not engage in widespread unfair trade practices, as do the other countries noted above. One strong indicator of this is the fact that Mexico had a significant, sustained trade deficit (current account balance) with the world which reached $32.7 billion in 2015 (latest data available), as shown in Figure A, below. This chart ranks countries based on their bilateral trade deficit with the United States. 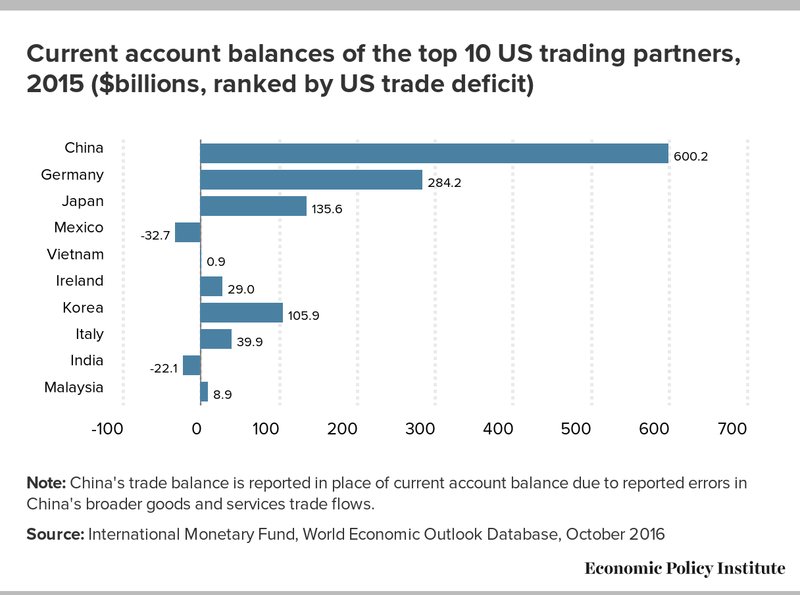 Thus, although the U.S. has a relatively large bilateral deficit with Mexico, that country did not contribute to global trade imbalances in 2015. Bilateral trade deficits are a poor basis for developing trade policy targets and trade remedy proposals. The countries that maintained the largest global trade surpluses in 2015 were, in order, China, Germany, Japan, Korea and Taiwan. Those countries, and others that maintain substantially misaligned currencies, and that engage in unfair trade practices, should be top priorities for fair trade enforcement by the Trump administration. These countries, along with other countries in Europe and East Asia, have developed a global trade surplus which reached $1.2 trillion in 2015 and 2016, as shown in Figure B, below. These countries are destabilizing global trade, and threaten to destabilize world financial markets, as well. And it is not just the United States that is suffering from imbalanced trade. Other countries with persistent, structural trade deficits, including the United Kingdom, Brazil, and Australia, are also being hurt and suffering substantial, sustained job losses. All of these countries could benefit from rebalanced global trade, and are potential allies in such efforts. Note: Data for 2016 are estimates from the IMF. Source: International Monetary Fund, World Economic Outlook database. Every trade surplus is offset by capital outflows from the surplus countries (it’s just double entry bookkeeping). Thus, the global economy is beginning to resemble that of the mid-2000s, which led to the global financial crisis and great recession. It is important to recall that one of the major causes of the last housing bubble was the great inflow into the United States of cheap capital from China and other large exporters. Thus, one of the greatest risks to the global economy is the return of the global savings glut, which was first noted by Ben Bernanke in 2005. Capital is flowing into the United States and other countries with large trade deficits, and may be generating unsustainable asset bubbles in, for example, stock markets and real estate in the United States. The Dow Jones Industrial Index has gained over 25 percent since December, 2013 (with half of these gains occurring in the past three months), and housing prices are soaring in many areas, especially on the coasts. If this growth continues, these asset prices may eventually become unsustainable, especially given weak growth rates in the United States (averaging 2.2 percent in this period) and in other developed economies (which are generally weaker). Thus, the stage may be set for another great financial crisis which could derail the current, weak recovery. For these reasons, it is doubly important to reduce global trade imbalances. To adequately respond to these threats, Congress and the president should enhance enforcement of fair trade laws and treaty obligations (through anti-dumping, countervailing duty, and World Trade Organization case filings) and implement better early warning systems and mechanisms for responding to import surges from China, Korea, Taiwan and other frequent violators of U.S. unfair trade statutes. In particular, the United States should begin to investigate and initiate anti-dumping, countervailing duty and other unfair trade enforcement actions on behalf of U.S. producers, workers and communities affected by widespread and pernicious violations of U.S. fair trade law and standards. The United States should also make reducing Chinese excess production capacity a top priority in bilateral negotiations, as it is this excess capacity that fuels much of the dumping of exports from around the world in the United States (dumped raw materials from China are exported around the globe for further processing, resulting in even more dumping from many other countries). In particular, overcapacity should be addressed by reforming state-owned enterprises, barring China from all U.S. government procurement contracts, and prohibiting SOEs from foreign direct investment in U.S. manufacturing or high tech companies. The United States should also consider imposing a border-adjustable carbon fee on imports produced by energy-intensive industries. In addition, World Trade Organization nations should continue to treat China as a nonmarket economy in fair trade enforcement, because granting China market-economy status would curb the ability to impose tariffs on dumped goods and thus allow Chinese companies to undercut domestic production by flooding WTO nation markets with even more dumped and subsidized goods. Also, China should not be rewarded for its market distortions with a bilateral investment treaty. At the end of the day, subsidies, dumping and excess production have so distorted production costs in a wide array of industries, ranging from electronic and industrial machinery to metal products of all kinds, automobiles, aircraft and other transportation equipment, and all kinds of industrial products that it will be impossible to put the evil genie of unfair trade policies back in its bottle through fair trade enforcement policies alone. Currency realignment provides the only tool available that is broad and powerful enough to provide redress for a generation or more of pervasive, widespread unfair trade policies. Thus, last but by no means least, the United States must maintain currency vigilance. Standards for defining currency manipulation and misalignment (under the Bennett Amendment which became law in 2015) should be updated to give priority to countries that maintain large, persistent, global trade surpluses. The U.S. Treasury, which issues semi-annual reports on the currency policies of major trading partners should identify and target for enforcement the countries discussed here, including China, Japan, Korea, Germany and Taiwan, and other currency manipulators based on a history of currency misalignment and the maintenance of large, structural trade surpluses (both in absolute dollar terms, and relative to GDP), beginning with its next report in April. Although China has not intervened in currency markets in the past two years, and Germany uses the euro, which floats, the currencies of both countries are heavily undervalued and misaligned vis-à-vis the dollar. Hence, more comprehensive policies are needed to realign major currencies in order to eliminate structural trade imbalances. For these reasons, it may soon be time to consider negotiating a new Plaza Accord to rebalance currencies and global trade. Fred Bergsten has estimated that the currencies of China, the EU and Japan, must all rise by 37 percent to 50 percent against the dollar (but substantially less on a multi-lateral, trade weighted basis) to rebalance global trade. But those estimates preceded the recent appreciation of the dollar, which has gained approximately 10 percent in the past year alone, so the required currency rebalancing would be larger still. While these measures may sound extremely ambitious, a similar realignment was achieved in the 1985 Plaza Accord. The United States was also able to negotiate a significant currency realignment following the end of the Bretton Woods system in 1971. What both of these cases have in common was that the United States threatened to impose (or actually did impose, in the case of Nixon’s temporary import surcharge in 1971) relatively large, broadly based tariffs on a significant group of exporters to this country, which persuaded them to negotiate broad-based realignments between their currencies and the U.S. dollar. It is time for the United States to undertake a fundamental re-evaluation and realignment of its trade policies and objectives. Although NAFTA could be reformed and improved, the last thing this country needs is more trade and investment deals. President Trump should implement a halt to the negotiation of all new trade deals. The federal government should develop substantial capacities to self-initiate fair trade enforcement cases, and we should take steps to end pernicious, wide-spread currency misalignment of the U.S dollar. Even these policies alone will not be sufficient to rebuild U.S. manufacturing. We can start by supporting strong and enhanced buy-American policies for all public investments. The United States also needs trillions of dollars of public investments to bring our infrastructure up to standards identified by the American Society of Civil Engineers. We need to invest in American research, development and innovation, in manufacturing extension services and in worker training. And while reform of the tax code could help, we also must avoid gutting the public sector by slashing tax rates, a step that will cripple our ability to provide these essential public investments. Donald Trump was elected on the promise that he will rebuild U.S. manufacturing and rebalance U.S. trade. Voters should be satisfied with nothing less. And they certainly should not be satisfied with xenophobia dressed up as trade policy.